Normally, I review products because they were sent to me or because they clearly indicate "NEW" on the packaging. 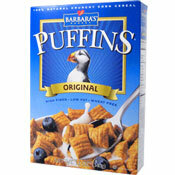 I decided to review this product just because it looked so mouthwatering delicious on the box. 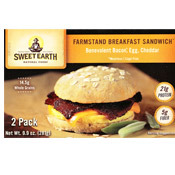 The complete name of this product is Farmstand Flaxbread Breakfast Sandwich (with) Benevolent Bacon, Egg (and) Cheddar. Benevolent Bacon is a meatless, cage-free bacon substitute that looks kind of authentic. There are 2 sandwiches in a box. Each one takes 80 seconds to microwave and about 3 minutes to cool to a reasonable temperature for eating. Unfortunately, the most prominent presence in this sandwich is the bread which is too dry and grainy. It masks the other the flavors making the cheese nearly imperceptible. The Benevolent Bacon meat substitute, by itself, is very nice. I liked it better than the popular MorningStar bacon meat substitute most people are familiar with. But for as good as the "bacon" is... it too gets lost. The egg adds more texture than flavor and it's no better or no worse than other microwave egg patties out there today. On the (kind of) plus side, one sandwich with 21 grams of protein kept me feeling full for about 3 hours. Bottom Line: This sandwich isn't anywhere as good as it looks on the package. If you find it cheap, I'd love to hear you opinion. Otherwise, I'd suggest skipping this product. 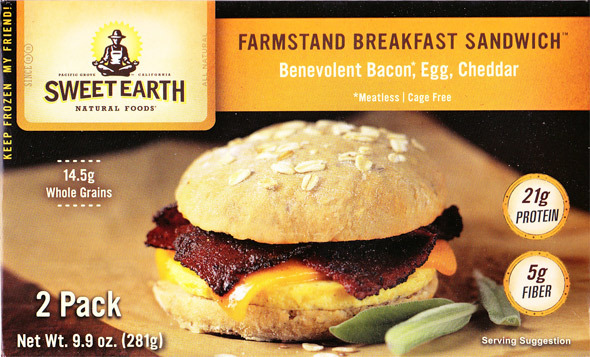 Nutritional Considerations: Each Farmstand Breakfast Sandwich has 370 calories, 19 grams total fat (including 6 grams saturated fat), 155 mg cholesterol, 490 mg sodium, 33 grams total carbs, 5 grams dietary fiber, 5 grams sugar and 21 grams protein. What do you think of Farmstand Breakfast Sandwich?